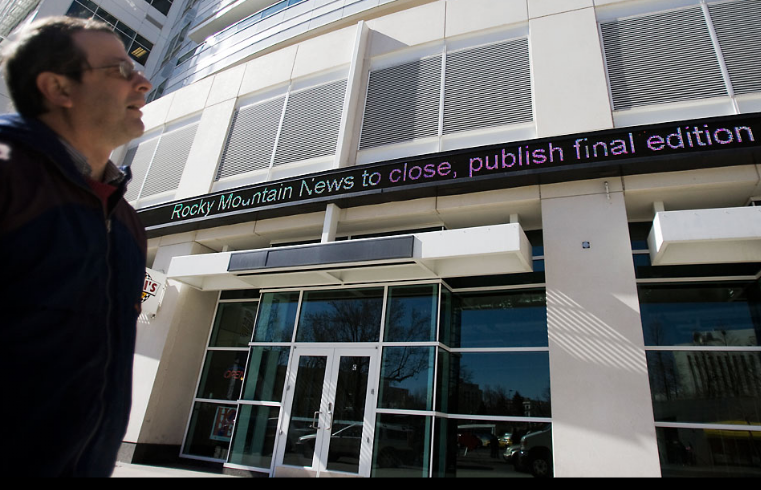 Today the Rocky Mountain News will publish its last edition and go out of business. The closing was announced to employees of the paper yesterday afternoon. Like the pros that they are, they had the story up on their website immediately. Not everyone gets to report on losing their own job, and I doubt it is an experience to savor. The coverage included a photo essay with these pictures. There may be some irony in a storied newspaper reporting on its demise with an online digital slide show, but the explanation of the paper’s collapse is not that simple. Nor will I go into it here. Let’s dwell instead on what it means to face the death of one’s job. That stunned look is the face of someone who has just lost his livelihood, who works in an industry where re-employment may be impossible, and who has to somehow make all that not matter to the child in his arms. He is one of many in this awful spot, but I would bet that he feels almost completely alone. The pictures tell the story of individual lives, a spreading economic disaster, and perhaps the death of an institution. The Rocky Mountain News was closing in on its 150th anniversary this year. American democracy is older than that, but its future has been secured for a long time by the press. Of course, it also is true that everything is changing, and the horizon is not uniformly dark, and the digital media are abounding with democratic energy while reformatting and extending much of what was good about journalism. 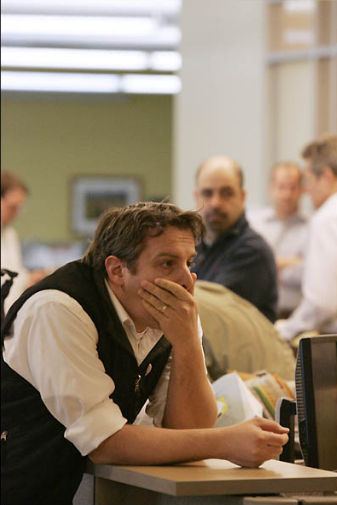 But the faces in the Denver newsroom show what happens when you stare into the future and see nothing there. Photographs by Darin McGregor, Judy DeHass, and Joe Mahoney for the Rocky Mountain News. Gripping post. This is so very sad and unfortunately the reality of so many these days. It’s not just sad, it’s outrageous. One consolation is that many of the writers and editors have opened a blog site iwantmyrocky. For many writers it’s not just a job but a need or drive. Further they are covering stories that the Post is letting slide.